Be the first to share your favorite memory, photo or story of Dorothy "Dottie". This memorial page is dedicated for family, friends and future generations to celebrate the life of their loved one. 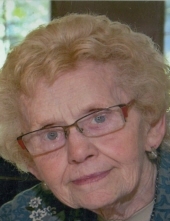 Dorothy "Dottie" Clark age 86, of Council Bluffs, met Jesus and went to Heaven surrounded by her loving family on April 10, 2019 and is now living in the Kingdom. Dottie was born on December 13, 1932 to Ruth and Thorwald Madsen. She was the youngest of 9 children. She graduated from Abraham Lincoln High School in Council Bluffs and worked for Omaha National Bank (now US Bank) for many many years. Dorothy married Russell Clark on December 17, 1955 and was a devoted wife for over 50 years and a loving mother to her four children, Lori, David, Marybeth and Jon. She was a life long resident of Council Bluffs. Dorothy loved life and family, and was an active member of Our Saviors Lutheran Church and enjoyed volunteering at the food pantry and helping decorate for special services. She was also one of the willing workers. Dorothy was preceded in death by her parents, Thorwald and Ruth; brothers, Arendt, Ralph, Richard, Roger and sisters, Ethel O’Donald, Alice Mckeague, Betty Madsen, Irene Lewis; her husband, Russell Clark in 2013 and son, David in 2016. She is survived by her children, Lori Clark, Marybeth (Roger) Myers, Jon Clark, and Dawn (David) Clark all of Council Bluffs; 9 grandchildren, Alana (Joshua), Matthew (Mackenzie), Nathan (Meghan), Jacob (Jenna) Lauren, Mitchell, Jessica (Danny), Andrew, Emily (Shane), and 9 great-grandchildren; nieces, nephews and many family and friends. To send flowers or a remembrance gift to the family of Dorothy "Dottie" Clark, please visit our Tribute Store. Guaranteed delivery before Dorothy "Dottie"'s visitation begins. Luncheon will follow immediately. Interment 1:30 p.m. at the Elk Horn Lutheran Cemetery, Elk Horn Iowa. Guaranteed delivery before Dorothy "Dottie"'s celebration of life begins. "Email Address" would like to share the life celebration of Dorothy "Dottie" Clark. Click on the "link" to go to share a favorite memory or leave a condolence message for the family.